This week begins with feelings of superiority and desire for recognized change. Many of us may feel undervalued, unseen, unappreciated. There are several cosmic changes occurring this week and this brings feelings of confusion, vulnerability, and discomfort. On Wednesday, March 20, 2019, the Sun will leaves Pisces and begin a fresh cycle in Aries. This solar shift occurs simultaneously with the rising of Spring (or fall in the Southern Hemisphere). We are moving into a new season both literally and figuratively and with any shift brings unexpected delays, surprises, and growing pains. The Full Egg Moon in Libra also occurs on Wednesday, March 20th and this brings internal challenges between self and others. When the Full Moon occurs in Libra we come face-to-face with our relationship to self-care, balance, compromise, social freedom, and beauty. There are also several major Planetary Aspects occurring this week that bring a level of intensity, dreams, emotion, and boundaries. Pluto in Capricorn will be opposing the North Node in Cancer all week and this brings delays, problems, emotional breakdowns in the area of our ambition and current life goals. This aspect brings illumination to family matters that may have been swept under the rug and now must be addressed and resolved. Venus in Aquarius will also Square off with Mars in Taurus bringing disruption to old stubborn ways of acting and moving through the world. Venus challenges Mars to think outside the box, to be more pliable and flexible in its rigid thinking and decision making tactics. We may see global rebellions against change, demanding that we act in a unified state rather than focusing on individuals and self-greed. A Sun and Chiron conjunction in Aries brings a personal wound to the surface. We are being guided to address a self-limiting issue in the best way that we can. If you’ve been avoiding taking responsibility in a certain area of your life this aspect will shake it up. A Venus and Lilith conjunction in Aquarius will support this transition to self-responsibility as Venus learns true power comes through Community. Many of us may be teaming up, building a stronger community to accomplish our universal goals on a broader level. A Mercury and Neptune conjunction may have us somewhat in a dream state this week, not wanting to face the truth of reality but will be forced to anyway. Write down your daydreams and your visions, plant the seed for future generations. For a daily update on what each day will bring sign up for our free daily horoscope here. You will receive an email horoscope everyday. Aries, this week requires you to stand tall in your personal boundaries without fear of loss. You may find yourself eager to battle but remember there is nothing you can’t have, become, or do. Do not waste energy trying to prove yourself but instead focus on your own needs. Use what you have as an inspiration to others that they can do the same. Your power is not a weapon. Your power is a gift. Use it wisely. Wednesday’s full moon illuminates your 7th house of partnerships. Relationships may require some sort of sacrifice but remember you have a say too. When the Sun moves into your 1st house of self on Wednesday, March 20th you may feel like you are finally starting to feel like yourself again. Take it easy. There’s no rush. Taurus, professional relationships may pose some sort of identity crisis this week. You may feel that work is getting in the way of your presence in the community and moving forward but there is a lesson here. Mars and Venus square off all week in your 1st house of self and this can be frustrating. You may feel like you are taking ten steps forward only to move thirty steps back. Be patient with yourself, especially on Wednesday, March 20th when the Full Moon in Libra illuminates your 6th house of work. This brings work issues and opportunities into a greater light. Take action but think before you say yes as the Sun’s entrance into Aries in your 12th house of closure on Wednesday grants you a 4-week journey through some of your deepest fears. Take your time making a decision. The next few weeks will bring you everything you need to choose. Gemini, this week may bring up frustrations and old doubts that what you are doing just isn’t working. You may feel like switching gears and focusing your energy on something else but hold on. A Jupiter and Lilith Sextile on Monday brings you the confidence that you need to step into a new idea with a sense of purpose and understanding. Relationships may bring conflict this week as others are having a hard time seeing things your way. If an elder gives you advice about something that you are working on, listen. But remember you are your own person, especially on Wednesday when the Full Moon in Libra illuminates your 5th house of fun and creativity. The Sun will move into your 11th house of Aries and you may suddenly find yourself in the limelight within your community. Don’t take it to the head, Gemini. It could all change in the blink of an eye. Be humble. Cancer, this week is tough for you as Pluto in Capricorn and the North Node in Cancer oppose one another for the next week. This energy has you feeling blocked, physically, spiritually, emotionally, and mentally. But remember you are not stuck, you are free but sometimes life brings limitations to build us stronger. Wednesday, March 20th may mark a huge date in history for you as the Full Moon in Libra brings light to emotional and internal issues hiding within your own system. If you’ve been denying old feelings or pretending that your own sense of security and self-love is not equally as important, you’re in for an intense awakening. The Sun’s entrance into your 10th house of Aries brings professional goals and ambitions to the forefront. It’s time to go for your dreams Cancer, no more holding back. Make the change. You do not need permission. Leo, things have been very quiet for you as you tended to your financial affairs and personal wounds. If you used this opportunity to do the soul work, the next six weeks could be magical for you as you explore a new way of seeing, viewing, and taking charge in the world. A Mars and Pluto Trine this week gives you the space and opportunity you need to make small but vital changes to your daily routines and your career. This week is encouraging you to get your personal life in order so that you can move into this new season with strength, vigor, and a newfound sense of humility. The full moon in Libra on Wednesday marks the illumination that you are not just a humble servant — you are a mighty warrior and gentle royal who deserves to express their needs with clarity and conviction. On Wednesday, the Sun enters your 9th house of mental exploration in Aries and all that was shed must be replaced with something new. Use the next six-weeks as an opportunity to explore new ideals and experiences. No one said you have to settle but you. Virgo, everything doesn’t have to be so serious or running in perfect order for you to be able to enjoy it. Relationships can bring a whirlwind of drama this week if you aren’t careful and watch that golden tongue. You naturally have something to say about everything but this is your week to lay low and just chill. A Venus and Mars square all week brings disruptions to you and your partners’ value systems. Do not try to sort through the madness this week. Let it play out. Wednesday’s Full Moon in Libra highlights your personal assets and finances. If you have neglected your own personal and financial needs it’s time that you start paying more attention to them. Remember you have to give to yourself too. 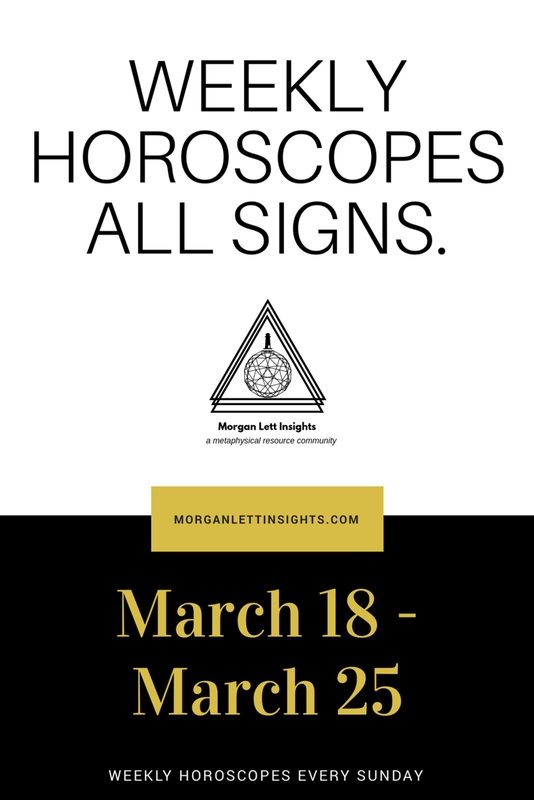 The sun enters your 8th house of Aries on Wednesday and the next six-weeks could be financially, spiritually, and emotionally taxing. Remember that everything you will work through is only clearing space for something new. Old fears, old doubts, ancestral trauma, and debt may steer you back towards a higher power. Give yourself time to internally heal now. Libra, there is no sense pretending you are secure about something if insecurity is eating you alive. A Venus and Mars square could have you feeling pressured to choose between reality and your dream this week, but remember where there is a will there is always a way. However, it’s time to face the facts Libra. If something isn’t working you have to fix it. A Venus and Lilith conjunction also occurs this week. This aspect brings you deeper into your personal power, your gifts, and your need for spontaneity and pleasure. With the Wednesday Full Moon occuring in your 1st house this month, personal issues around your self-image, personal goals, and life purpose come up for review. The Sun also moves into your 7th house of Aries on Wednesday bringing fire and passion to your relationships with others and especially with self. Take this week to focus on your own goals, and how you can establish more independence for yourself. Relationships may challenge you but stand firm. Compromise doesn’t mean becoming a martyr. Believe in yourself. You got this. Scorpio, this week challenges how you express yourself in relation to your goals. You may have been dreaming of an opportunity your whole life that is now right in front of you, but something is blocking you literally and figuratively from reaching it. This may come from an emotional blockage because you aren’t giving yourself permission to feel something, to declare privately and publicly that this is what you want but you need to. A Pluto and north Node opposition all week requires you to acknowledge the spaces that you are emotionally, spiritually, physically, and financially stuck. The Wednesday Full Moon in Libra illuminates your 12th house of closure and this brings light to all the ways you have been playing small and bending your will to meet the demands of others. The sun enters your 6th house of Aries on Wednesday and it’s time that you start taking control of your day-to-day actions so that they reflect the work that you are trying to portray. Don’t expect anyone to do this work for you. Working independently may be the best choice for you right now. Sagittarius, life changing transitions are occurring in the realm of personal finance and community relationships. You are transforming the way that you gain in the world, but make sure that these changes are coming from a sincere space. Make sure that your desire to reform the community through financial privilege is for the greater good of all and not one man or woman. Jupiter’s Sextile with Lillith in your first house gives you a boost of confidence that you have the power to be whatever you need. A Sextile with Venus also provides you the connections you have been searching for to build a greater sense of security for yourself and Home both externally and internally. The Full Moon in Libra highlights your 3rd house and suddenly you may feel this desire to put on your best outfit and perform. If you’ve been holding back your sense of self-expression and dynamic personality an emotional awakening will help you transfuse that. On Wednesday, the Sun enters your 5th house of Aries. Relationships with your talents, desires, and children may flourish and demand some attention. Dust yourself off and put yourself out there, you can be the star of your own stage baby. Capricorn, your entire identity is changing and this stirs up deep emotional transformation. A Mars and Pluto Trine this week encourages you to remember that change is not a race nor a destination. Change is a never ending journey that shifts moment-by-moment and the best way to handle it all is to lean in one step at a time. Pluto also forms an ongoing opposition with the North Node all week long, intensifying your dilemma between work, self, and family. Something is spiraling out of your control and you are forced to sit with it, but see this as a learning lesson and know that something magnificent will be birthed from this. The Libra Full Moon on Wednesday illuminates the relationship between your profession and yourself. If you’re life has been off balance due to work demands you will see that clearly now. On Wednesday evening the Sun enters your 4th house of Aries and the next six-weeks will focus on taking personal action towards building a nest egg, security for yourself, family, and home. Aquarius, this week brings a sense of closure and understanding to issues surrounding your close family, home life, and long-term security. A Venus and Mars square creates friction in your emotional and home life. But this is the first step towards more freedom, more acceptance, more stability in how you build your future. A Lilith and Venus conjunction also stimulates your self-confidence in your own power. You are stronger than you think Aquarius. This week demands that you trust that knowing — feed it, water it, give yourself permission to grow. The Libra Full Moon on Wednesday illuminates your 9th house. Old ideals surrounding relationships with others and yourself need to be let go of. Give yourself permission to experience something new. You don’t have to repeat the same love story over and over. The Sun enters your 3rd house of Aries on Wednesday and the next six-weeks requires you to step out and be bold in how you express your emotions and creativity. Think outside the box — you never know where you will go. Pisces, you’ve been through a lot these past six months but your healing journey is finally shifting towards the light. With the Sun in Aries forming a conjunction with Chiron all week, this is a new beginning for you and how you value all you offer. Be bold about your gifts. There is no sense of hiding behind your greatness any longer. With Mercury still in retrograde in your 1st house of self your ability to express is undergoing enormous change. If you still feel unsure or cloudy that’s okay. The Full Moon in Libra on Wednesday illuminates your 8th house and this can be an emotionally, spiritually, and financially stressful time for you. You may feel that you’ve overlooked your financial situation for too long and now there’s no turning back, but there is. The Sun enters your 2nd house of Aries on Wednesday and it’s time that you get serious about your assets and finances. Take charge of your opportunities, no more waiting for someone to do it for you.